Islamic State terror group supporters have attempted to frame Christians for the massacre that killed 305 people at Al Rawdah mosque in Bir Al-Abed, Egypt, using it as a means to call for revenge attacks against Christians over the Christmas period. The Middle East Media Research Institute, a nonprofit monitoring group based in Washington, D.C, reported that IS refuses to accept responsibility for the terror attack on the mosque, and has been attempting to blame Christians for it. MEMRI explained that a Telegram channel under the name "The Sons of Jesus Movement" was opened last week, which claimed that it was behind the Nov. 24 attack on the mosque in Al-Rawdah. The supposed group alleged that it has photographic evidence from the attack, though MEMRI pointed out that there is no evidence that a "Sons of Jesus" group actually exists. "Furthermore, the statement was apparently first disseminated by IS supporters. The statement seems, therefore, to be a crude fabrication by IS supporters in an attempt to deflect blame for the horrific attack on the mosque," the institute stated. IS supporters have been using the situation to target Christians, with the terror group's Egypt Province calling for "revenge" against followers of Jesus in the country. "A black holiday upon you, oh Christians of Egypt, and upon whoever brought you. With Allah's permission, we will take revenge on you, and for the actions of your patrons — the bombing, shelling and destruction of homes and mosques on the heads of innocent subjects of the rule of the caliphate," the IS statement reads. "By announcing your responsibility for the attack on the mosque of Al-Rawdah you opened on yourselves the gates of hell. Even if your announcement is fake, it came at an appropriate time." The statement continues with warnings of military operations, declaring that Christians will not be safe even in their own homes. "So go forth, oh worshipers of Allah, blow up their churches and monasteries, kill their priests and monks, do not show mercy towards any Christian for they are all belligerent towards Allah's religion." Egypt's minority Coptic Christian population has been targeted on several occasions this past year at the hands of Islamic radicals, though the mosque bombing was the deadliest terror attack the nation has suffered in modern history. Egypt's public prosecutor's office said in November that IS appears to be behind the massacre, citing witnesses who have said that gunmen brandished IS flags as they opened fire through doorways and windows. "The worshipers were taken by surprise by these elements," the prosecutor said in a statement at the time. 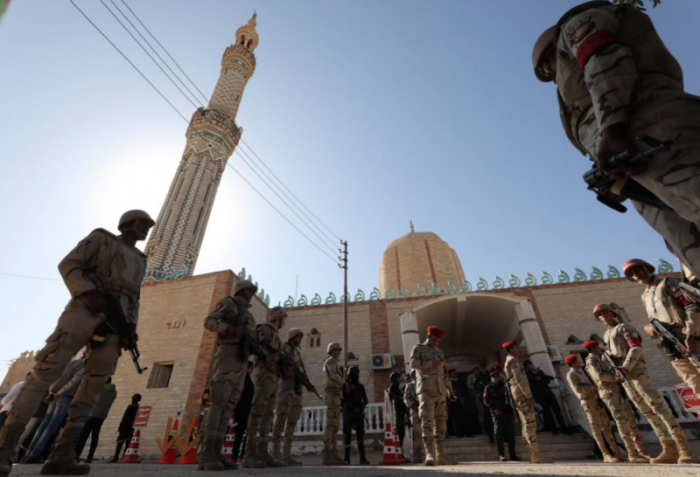 "They numbered between 25 and 30, carrying the Daesh flag and took up positions in front of the mosque door and its 12 windows with automatic rifles." In addition to repeated calls for attacks on Christians in Egypt, IS supporters have also been warning of violence in major European nations, including the U.K., Germany and France. In November, the terror group published a poster warning of "Christmas Blood" at St. Peter's Basilica at the Vatican. Jeffrey Treistman, an assistant professor of national security at the University of New Haven, told The Hill at the time that the threats "should be taken seriously by law enforcement agencies." "It is essential that security experts remain vigilant during the upcoming Christmas holiday and closely scrutinize their list of radicalized individuals who are most likely to heed the Islamic State's call for violence," Treistman warned.